If you’ve been hanging around here at Darcie’s Dish for any length of time I’m sure you’ve noticed that I’m a wee bit obsessed with Mexican food. I just can’t help myself. When I was pregnant with my four kids I craved Mexican constantly. My poor husband had to eat it just about 5 days a week. Sorry, babe! At least now I’ve cut it down to two times a week. Since I just can’t seem to get enough Mexican, I’m constantly trying to think of ways to recreate the flavors. 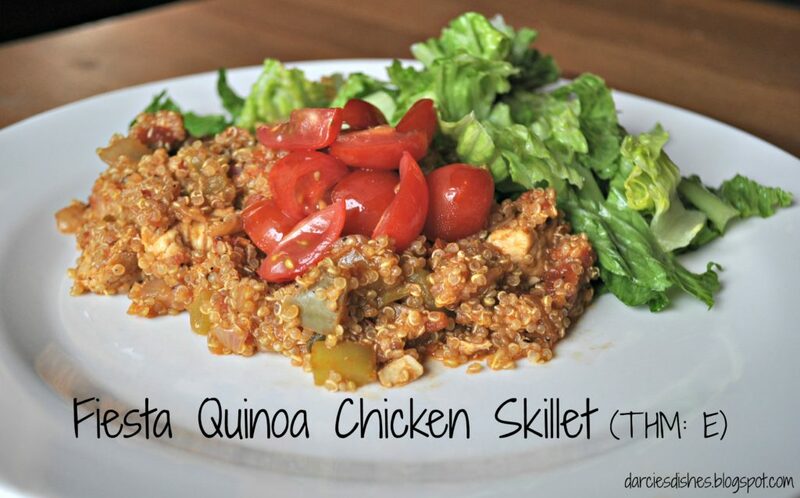 I’ve recently fallen in love with quinoa. I always liked it before, but I’ve really learned how to flavor it well and now I just can’t enough. Plus it’s such a nutrient-dense food that I feel great feeding it more and more to my family. If you’d like to learn more about quinoa and all of its amazing health benefits read this article. Very informative! One tip I will tell you about quinoa is to always, always, always rinse it before cooking it. If you do not rinse it, it will taste very bitter. Please rinse it, you don’t want to ruin your whole dish. This meal has just a kick of spice to it, but not too much that your kids won’t eat it. Even my 2-year-old gave it his thumbs up approval. Plus it only takes one dish to prepare the WHOLE meal!! I love as little clean up as possible. Can I get an amen? To make this dish start by heating 1/2 T. of coconut oil in large skillet over medium heat. Once it is melted add chicken to the pan and cook until the chicken is no longer pink about 8-10 minutes. Remove chicken from the pan and set aside. Add the other 1/2 T. of coconut oil and let it melt over medium heat. Then add the onion, bell and cubanelle peppers. Cook until onion is softened and translucent. Add the garlic and cook for 2 minutes more. Next, add the taco seasoning to the pan and cook for 1 minute, stirring frequently. Add the tomatoes with their juices, chicken, quinoa, water, and salt to the pan. Bring the mixture to a boil, cover and reduce the heat to a low simmer. Cook until quinoa is done, about 18-20 minutes. 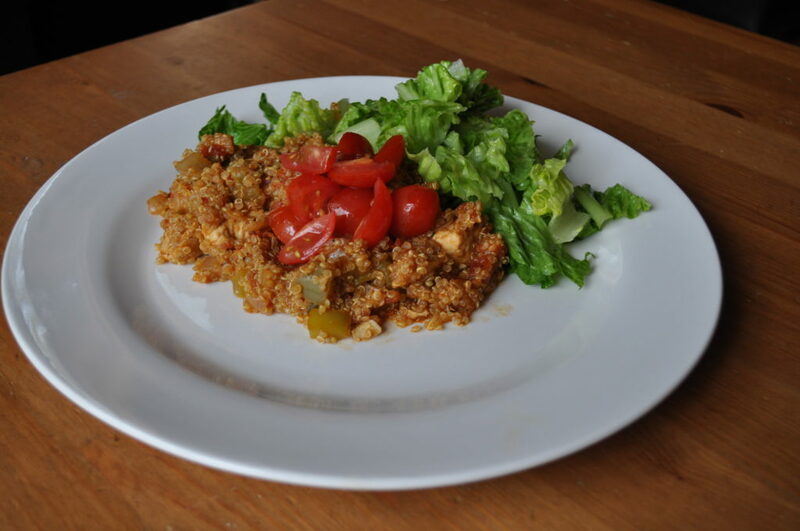 The quinoa should be soft, but not mushy. Taste and add more salt if needed. You can top it with tomatoes, salsa, green onions, cilantro, pickled jalapenos or 0% Plain Greek yogurt. Serve it alongside lettuce. Heat 1/2 T. of coconut oil in large skillet over medium heat. Once melted add chicken to the pan and cook until the chicken is no longer pink. Remove chicken from the pan and set aside. Add the other 1/2 T. of coconut oil and let it melt over medium heat. Add the onion, bell and cubanelle pepper. Cook until onion is softened. Add garlic and cook for 2 minutes more. Add the taco seasoning to the pan and cook for 1 minute, stirring frequently. Add the tomatoes with their juices, chicken, quinoa, water, and salt to the pan. Bring to a boil, cover and reduce heat to a low simmer. Cook until quinoa is done, about 18-20 minutes. Taste and add more salt if needed. Serve with a side of lettuce and any of the additional toppings. What taco seasoning did you use? Going to try to make this tonight. Will serve it with rice for my non THM family members. May throw in a little pinto beans for me. That should still make it an E? right? Could all of this be thrown into a crock pot before work and be ready when I get home?